ID cards are a practical means for achieving higher company security while easily identifying employees and visitors. Corporations have always used photo identification to ensure security, but today�s ID card technology outweighs yesterday�s performance options. Modern ID card software allows you customize an employee ID program to suit the needs of your company, from creating standard photo IDs to programmable badges that grant or restrict facility access and computer systems. With ID Security Online�s photo ID systems it�s easy to produce strong full color photo identification cards for a variety of uses. Systems are equipped with name brand card printers from reputable manufacturers, intuitive ID card software, high resolution web camera, color ribbon and durable PVC cards � a comprehensive package to set up your program easily and quickly. Once you�ve set up your system, you can begin producing top-of-the-line ID cards and badges and configuring your settings how you see fit. Whether you�re looking for PVC cards, Contact or Contactless, Proximity or Wiegand Cards, ID Security Online is your one-stop solution for ID card-printing needs. We also carry pre-printed cards, ideal for clients who require the same information printed on many cards and our ID cards come in both 10 and 30 millimeters and include Mag Stripe Composite and Adhesive Back options. A special section of our site is designated solely for Access Control and security needs. Here you can browse through a range of technology cards designed for achieving increased building security measures. Some of the variant uses for these cards typically include, but are not limited to driver�s licenses, official government identification, access passes and company security used for tracking human movement throughout the building. Fargo�s line of single and dual-sided card printers/encoders are each designed with a specific set of tasks in mind. HID/Fargo designed this printer specifically for large organizations with more stringent security and volume requirements than were available with the DTC1000 printer. But the goal was not to cloud intuitive use, compatibility and flexibility with indecipherable technological advance and complexity, but rather to find a way where both ends could be met in one easy-to-use and advanced printer/encoder. And like other Fargo models, the DTC4000 represents an advanced generation of high quality specialization printers that efficiently carries out its tasks. Today�s consumer demands a high level of compatibility and so the DTC4000 serves on these expectations as a highly intuitive product requiring very little operational training. HID/Fargo sought to design a printer as simple as it was sophisticated. The DTC4000 is field upgradable, small and light, contains encoding options, is compatible with professional environments, has advanced security and encoding options. The DTC4000 is field upgradeable and customizable in accordance with a breadth of complex projects and uses. Using the field upgradability feature you can toggle between single and dual-sided printing and adding magnetic stripe, HID proximity, iClass contactless and/or contact chip encoding functionality. It is also Ethernet compatible, which was optional with the DTC400e, DTC550, Persona C30e (now discontinued) and as a standard accessory with the DTC5000. Configuring the printer is very easy and completed via the standard window and tab combination. Once your printer is installed, you can simply open the Configuration Tab and select whether you want the printer set on Dual-Sided, Magnetic Encoder, Dual-input Card Hopper, or Input/Output Card Hopper, which, by the way, is a same-side card hopper. These advanced flexibility options mean that this model can serve a wide variety of industries and job descriptions, such as hospitals, schools, businesses, banks and legal and administrative institutions, not to mention the high tech industry. Its physical design is also ideally-oriented for office and institutional use, with dimensions making it compatible with most professional environments. The weight and dimensional specs of the single-sided printer are 8 pounds at 9.8 inches high, 17.6 inches wide and 9.2 inches deep, and the specs of the dual-sided printer are 10 pounds at 9.8 inches high, 18.2 inches wide and 9.2 inches deep, making it not much larger than a standard shoebox. At the same time, it comes with an optional same-side input/output card hopper accessory, which means that the DTC4000 can be inconspicuously placed in most places in your office. As long we�re discussing location, it is important to consider where placing your printer as there are some guidelines to consider. Like with other printers and most electrical machines, the printer should be placed in a location with sufficient air circulation, which prevents internal heat build-up. Keep in mind that although the printer is small, you should allow for enough room for people to walk in front of it when its covers have been opened. You should also avoid installing the printer in areas near heat sources such as air ducts or in front of a window where the printer will be exposed to direct sunlight. Also avoid placing it in areas of high dust accumulation or mechanical vibration. If the printer is brought directly from a cold to a warm, or a dry to a moist location, there may occur a build-up of moisture condensation, which can negatively affect the print quality. In such a case, unplug the printer and leave it in a dry room for several hours, which will cause the moisture to evaporate. The DTC4000 comes with a sophisticated security encoding system that includes password protection to allow only select and approved administrators to carry out print jobs and encode security badges and cards. It also comes with an Ultraviolet layer for an increased security level regarding the physical card once printed. This fluorescent panel works by producing grayscale holographic text and images that are only displayed when the card is placed under UV light and are excellent fraud-battling measures. This is part of what makes this printer appropriate for banks, other financial and governmental institutions. The DTC4000 can also be password protected at the printer so only approved operators can print and encode plastic security cards and badges. A feature available only with the DTC4000 is the option to select the fluorescent panel ribbon. Mentioned briefly in the previous paragraph, the The YMCFKO (yellow, magenta, cyan, fluorescing, resin black)/YMCFKOK Ribbon is an cost-effective method to customize the security measures of your photo identification cards. You are even able to create a custom image to appear as a holograph on your cards. The design of Fargo card printers necessitates highly specific supplies, such as ribbons, to function correctly, such as the one-piece disposable ribbon cartridge load system used by both the Fargo DTC1000 and 4000 models. While you are able to use supplies belonging to other printer brands, it is highly recommended to use only Fargo certified supplies, which will prolong the life of your printer and maximize its print quality. Using supplies belonging to other brands as well nullifies your warranty in locations not prohibited by law. Other warnings can be found in the DTC4000 User Guide. The encoding options and ISO standards, as discussed previously regarding field upgradability, can be changed easily in the traditional window and tab format, such as when printing a document. Encoding options include a 125 kHz (HID Prox) reader, a 13.56 MHz, compatible with iCLASS�, MIFARE�, ISO 14443 A/B, ISO 15693, a read/write encoder, in Contact Smart Code Encoder, ISO Magnetic Stripe Encoding and dual high- and low-coercivity. More information is available in DTC4000 User Guide. 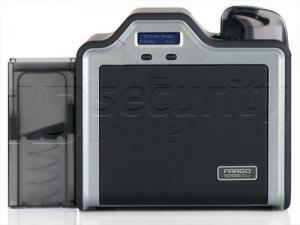 ID Security Online would like to announce the replacement of the Fargo C30e with the Fargo DTC1000. The two provide many of the same features and reliability that you've come to know and the only differences are several upgrades in the Fargo DTC1000. For example, the DTC1000 has a print speed of 24 seconds/per card for one-sided color prints, versus 27 seconds/per card in the older model, and 31 seconds/per card for double-sided color prints versus 35 seconds/per print in the Fargo C30e. The new model comes with a combination of Ethernet and USB, while the C30e came with the option for Ethernet as an accessory. The C30e holds 2MB of RAM, in contrast to the DTC1000's 3MB. The operating systems in common between both models are Windows 2000, Windows Server 2003, Windows XP and Linux, and the DTC1000 is also compatible with Windows Server 2008, Windows Vista (both 32- and 64-bit) and Windows 7 (both 32-and 64-bit). ID Security Online is proud to announce Evolis� most recent addition in card printers � the Evolis Zenius. A genius of a product, it is a single-sided plastic card printer that fits snugly in most locations, such as front desks, counter tops, and just about anywhere in your office. The Evolis Zenius also makes itself seen and not heard given that it is a quiet printer, even more ideal for a productive and relaxed working environment. The Zenius is also an intelligently-designed machine, equipped with an LED control panel guide walks you through the print job process. It also comes with several other useful features and alerts you when the feeder is empty and when it�s time to clean the printer or replace the ribbon. Designed with a 50-card capacity and with the card feeder and output tray both located in the front, it also minimizes the amount of space it takes up. It can create including thermal transfer monochrome and color-dye sublimation color cards with a resolution of 300 dpi and is compatible with both contact and contactless cards. It can be very conveniently used in a variety of purposes, such as access badges, loyalty cards, student ID�s, transport passes and payment cards. Utilizing features that as-of-now have only been offered by advanced systems, the Evolis Zenius is sure to make your printing experience easy and enjoyable. PVC Cards � Put together an estimate of how many cards you will need a year and order them with your printer. About one to two months before you are set to run out, put in a reorder so you will not risk running out. Ribbon � Always keep extra ribbons on hand so you won�t experience any outages with your printer. 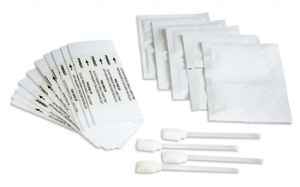 Cleaning Kit � Cleaning kits are extremely important when it comes to maintaining your printers health. It is much more cost efficient to buy a cleaning kit now than to pay for a new printer later. ID Printer Dust Cover � This keeps dust and other small particles from getting into your printer and building up when it�s not in use. ID Camera � Digital cameras allow you to take professional looking pictures for all your employee�s. A professional picture puts out a good company image! Lanyard, Badge Reel, Etc � Helps protect against lost or misplaced cards and allows you and your employee�s to wear the company badges with pride. You have the option of customizing lanyards with your company name and logo to promote brand recognition and company pride. Badge Holder � Protects your ID card from damage and allows your to carry more than one card at a time. Slot Punch � Makes it easy to attach your badge to a lanyard or badge reel. Extended Warranty � Protecting your investment with an extended warranty is a good idea especially with costly devices like badge printers. Data Capture Devices �These allow you to read barcodes, magnetic strips, or users fingerprints. Once you have received your printer, you have to make sure that all the supplies and accessories that should be included with your purchase are packaged with your printer. Carefully look over all the supplies and make sure nothing was damaged in the shipping process. If anything appears to be missing or damaged, call IDSecurityOnline right away at (800)-897-7024. If everything is in place, you should work on finding a location in your office that is accessible to everyone that will be using the printer. It is extremely important that you do not keep your printer in a high-risk area like near a heat source (a radiator, or direct sunlight) or an area prone to dust build up, vibration, or shock. Download the printer driver onto any computers that will be using the printer. Make sure to thoroughly read the instruction manual before using your printer. This manual will give you printer specific instructions on how to install ribbons and load your blank cards. In some cases, if instructions are not properly followed, your machine may malfunction and your warranty will be voided. It is always a good idea to print a test card once you have installed your machine so you can verify that it is in working order and you are able to familiarize yourself with the printing process. If you feel that you or any of your employee�s need assistance with learning about the machine or accompanying software, feel free to schedule an appointment for our training program. All training is done via phone or web by one of our highly knowledgeable printer specialists. So now you have your supplies and your printer has been installed. Now It�s time to consider what you want to put on your company ID badges. Before coming up with a design for your badges, you should think about what information you want to display on your badges and work on a layout that caters to the information. Keep the information displayed on the card simple. Excessive data makes the card look disorganized and is going to be a hassle for security personnel to authenticate. Also make sure not to put any sensitive information on the card such as a Social Security number so that identity theft is not an issue should the card become lost or stolen. This information should get you up to speed on starting up an ID badge program in your office. If you have any questions, feel free to call and a member of our team at (800)-897-7024 will be more than happy to assist you. HID�s already popular ID card printing service just got better. With the arrival of their newest product, Asure ID 7, clients are now able to have a simpler and faster card printing process. The new software includes some great new features and functions that transform the ID card printing process from a tedious task to an exciting lightening fast high quality experience. Already have Asure ID software? Current users of Asure ID 2009 are eligible for a free upgrade to Asure ID 7. Find out how by visiting ID Security Online�s Asure ID 7 upgrade program page. The purpose of this post is to inform the reader of the various types of ID cards that exist out there in the printing world. My hope is to present a brief, but high quality, catalogue of the different ID cards as well as an explanation of what the cards are typically used for. Many of the types of cards explained herein overlap to some degree. For example, one type of card might be a general category of card, while several others are types of that card that belong in that general category. An Access Control card is designed to grant access to an enclosed area, be it a business office, airport, or government-type organization. Access Control is a general category, and access control cards can take the form of proximity cards and come with the option of displaying a photo of the card holder. Access control cards typically contain magnetic chips that grant the user access. A Clamshell Card is a protective covering used to house a contactless smartcard. Flexpass Imageable cards are particularly useful for barcode transactions or those which require magnetic stripes and a dye-sublimation printer can be used to print digital images and graphics onto their surface. An embeddable card, sometimes also known as embedded cards, is an RFID card embedded with a chip. The card can be used for access control, purchases and cash withdrawal and this type of card has been in use for several years. An ID card with a built-in hologram, an added security measure from counterfeiting. The �key� in iClass Key refers to a small contactless smartcard placed in an also-small plastic knob. It serves the same purpose as most access proximity cards as long as the function does not require you to present a photo ID. Some of the plusses of this technology is that it protects your card from the elements and can be easily carried on a key chain or some similar accessory. The �tag� in iClass Tag is a contactless smartcard device roughly the size of a coin and is a transponder that you can attach to a non-metallic surface. The international standard that defines ID proximity cards and its communications transmission protocols. A patented contactless smart card standard corresponding to ISO 14443. An SDK is a software development kit that is used to create applications for software packages and other platforms. A Wiegand card utilizes embedded ferromagnetic wires, ferromagnetism being the mechanism that causes materials to be permanently magnetized, even after the energy field is removed. These wires are turned away in a strategic fashion as to generate the user�s individual ID number. A badge reel is a simple little gadget, a badge accessory that holds your badge in place with a retractable cord that allows you to latch it onto your clothing. It lets you comfortably walk around your place of work without having to hold onto your name badge or reach into your pocket every second to retrieve it (which shouldn't be a need anyway because most people in your workplace know who you are). It also can give you a sense of belonging in your workplace given that most badge reels sport their companies name or a customized graphic. Many of them have a white label that features your company logo beneath a clear dome. Business-wise, badge reels promote your company's brand � in some way it can be seen as a walking advertisement of sorts. Consider that you're at the grocery store doing some shopping. While deciding whether to buy green or red apples, someone sees your badge reel and strikes up a conversation with you about your line of work and your company. In the most unintentional manner you've now brought your organization and its goals to someone's attention (and you prepared to make a nice apple pie in the process). Who knows? Perhaps in the future this individual might contact your company for business or refer a friend. Badge reels come in a variety of shapes, colors and sizes, such as round and square, heavy duty and custom made. Heavy-Duty Custom Badge Reels, for example, are not your typical badge reels, and are made with high-quality, durable construction and are designed to withstand the roughest work environments. Most of them were also designed to hold clips, pins and magnets, useful for quick and easy attachment and detachment. Generally speaking, a cord is usually around 64 millimeters long and is rated for 100,000 pulls and fall within the range of $70 to $90. I would definitely say that finding a good badge reel provider is a good thing for your company, especially since it seems to be the "in" thing right now. Don't take my word for it though; next time you're at a business event of some sort, or if you visit someone's office, take a look around and see if people are wearing them. Chances are that you will. Fake ID�s are a real problem, as any police force will tell you. This is true as well a number of other institutions, such as convenient stores, who require people to present a valid photo ID before being granted permission to purchase. This is equally important for the professional business atmosphere, which has a lot to gain (and much to lose) from a poorly-set up security structure where many companies require both employees and visitors to present a company-issued ID in order to get beyond the lobby area of a building. A breach of security caused by a counterfeit ID card can lead to individual harm, loss of information and the prevention of identity theft, all of which can then lead to irreparable personal and professional damage. You can also increase your security by employing visitor badges, which expire after a given period of time. An employee�s or visitor�s use of an expiring badge allows you to track his or her time of entry and exit and increase your ID Security. In our ever-increasingly technological world, not to mention one in which crime is still a factor, the need for security has not expired. Visitor Management is a buzzword as much today as it was yesterday. Fortunately, even though technological advances have made the world of cybercrime more complex and sophisticated, traditional security still functions in very much the same was as it always has. The main concern is with instituting preventative measures to control physical entrance and exits from corporate buildings. Expiring badges deal with this challenge in a very effective manner, granting to individuals access for only a given and predetermined period of time. The run-of-the-mill check-in/check-out system also assures who is entering and leaving the front doors. Be it for the corporate world, sporting events or school functions, ID Security Online specializes in security badges for all your security needs. Go to our Visitor Management section at ID Security Online or contact one of our staff members by contacting us free of charge. Human beings don�t live forever, and neither do card printers. And the reality is that regardless of the quality (and the price), every card printer has its day. Although a typical card printer comes with a standard warranty of 2 years on parts and labor, there is some variation, as some come with a warranty of 3 years. However, retransfer printers come with a lifetime warranty on parts and labor, including the print head. The reason for this is that retransfer printers utilize a unique printing method that functionally eliminates the need to factor in the cost of a replacement print head. What�s the difference, you ask, between a direct-to-card printer (DTC) and a retransfer printer? During the DTC printing process the print head comes into repeated contact with rigid cards. Typically-speaking, a company printer can print on the order of thousands of cards per month, gradually wearing down the print head. The retransfer method avoids this deterioration by retransferring the image onto the retransfer film, hence its name, thereby significantly extending its lifespan. What�s more is that print heads cost between approximately $500-$900 and is considered to be a commonly-replaced part in DTC printing. Using a retransfer card printer also often translates into higher return on investment, which means that you can save your company a good deal of heartache and money. There�s also the question of to replace or not to replace. Many factors can affect this decision, such as the decreased cost of ID card printers and technological improvements that necessitate system upgrades. It�s also noteworthy that a printer evaluation fee, minus the cost for the actual repair, figures in the ballpark of $120 or more. Not exactly a walk in the park itself, though tolerable. Finding the optimal card printer for your company can be an easy, and even enjoyable, process. ID Security Online�s experts will listen to your needs and help you find the best printer for your organization or business. ID Security Online�s consultation team also helps you determine the best software system for your application, walking you through the installation process and teaching you how to operate it on your own. Our technical support group will help you deal with any printing system issues so you can experience the best possible usage from your card printer. 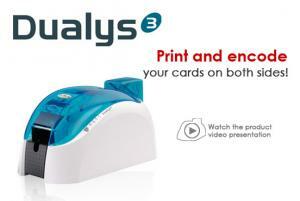 With the Evolis Dualys ID card printer you will be able to print and encode your ID cards on both sides. The Evolis Dualys card printer is one of the fastest card printers on the market and produces the stunning image quality. No training needed. This ID card printer is ready to go out of the box. With a convenient clam-shell opening maintenance and loading are greatly sped up. Feed one card at a time or use a card feeder. Configured and ready to go in just a few clicks. Dual sided color cards print at a rate of 125 cards per hour. Dual sided monochrome cards print at 350 cards an hour. One sided monochrome cards are printed at the rate of 1,000 cards per hour! From bulk personalization to single card printing this printer prints on both sides of the card in high-resolution color. For fast dual-sided printing the Evolis Dualys ID card printer can not be beat. It�s one of the fastest ID card printers available. You can be up and running in no time with it�s user friendly features.